Our 2019 Cross Country Season begins with our summer training session, starting on July 8. The Woodbridge Invitational is this Saturday evening/night at the SilverLakes Sports Complex in Norco. Here are directions form the high school. Our race schedule is pretty long because we have boys running in both the Novice division at the beginning of the meet and the Sweepstakes race at the end of the night. We will have one bus going to the race and one bus returning after the Sweepstakes race. If you are running in the Novice, Freshman, or Sophomore races, you should ride the bus to SilverLakes. For Juniors, Seniors, and Varsity, you can arrange your own transportation. The bus will leave THHS at 1 pm to go to SilverLakes. The bus home will leave at 10:30 pm. We will not practice on Saturday morning, so please sleep in. The following information is from the meet director and should answer any questions about parking and entry for spectators and runners. Runners can be dropped off in the facility. No Dogs period: Please make it clear to your parents that “No dogs allowed in the facility”. Edward Cheserek will be at our meet on Fri and will be actively interacting with your athletes. T-Shirts/Souvenirs: Skechers Performance will have meet shirts, patches, hats, shoes, at huge discounts, running apparel, etc., etc. Medals: Please direct your athletes that finish in the top 100 to go to the Awards area to pick up their medal. The metals will not be handed out in the finishing line/chute. Team Patches: If your team finishes in the top 6 in your race, please pick up the plaque at the awards area. Every year we have many of these plaques left over. Top 6 teams in each race earn a team plaque. Food: Lots of food items to choose from at the SilverLakes Snack Bar, food trucks and restaurant. The 3rd edition of the Alumni Challenge was held on July 28, 2018 at Trabuco Hills High School. The 2.98 mile course is a mix of grass, pavement, wood chips, and the track. With a significant hill in the 2nd mile, every runner is challenged to maintain their effort and pace through the finial mile. The race was won by two-time defending champion JT Sullivan (class of 2007). The current team won the challenge with a score of 20-54, taking places 2-6. There were plenty of supporters on hand for the early morning affair. Thank you to everyone who came out to watch and help with the post-race potluck. 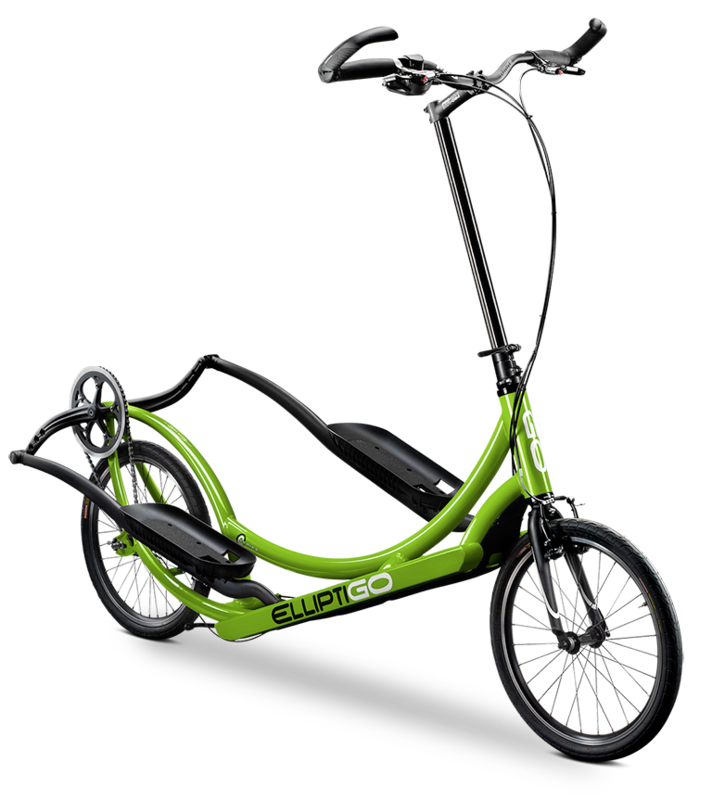 The Cross Country Team at Trabuco Hills High School is looking for help to purchase two ElliptiGO 8C cross training bikes. The bikes are intended to help our runners avoid serious injury without sacrificing precious training time. Our runners put in a lot of miles and work hard to compete with the best. These bikes will help us keep them healthy and running their best. A small donation of $10 is all we ask you to consider to help us continue to keep pace with the best programs in California. 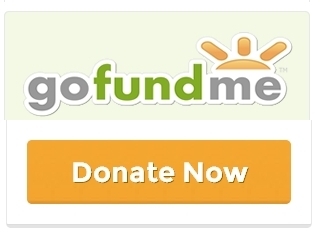 Click below to donate. 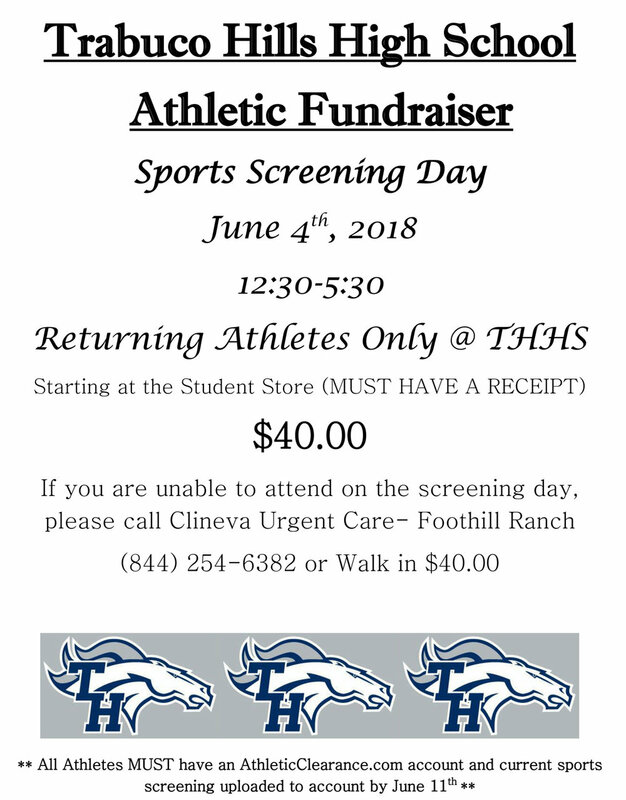 The Trabuco Hills Sports Screening Day is June 4, 2018 in the Library. This event is a fundraiser for the Athletics Department. The third edition of our Alumni Challenge race will be held on Saturday, July 28. We will run the home course on campus at THHS, which is 3 miles over mixed terrain with a hill or two in the middle. This is also the only Tryout date for Boys Cross Country. Boys wishing to tryout for Cross Country must participate in the race. We will run a 2-mile version for incoming Freshmen. The race is 3 miles, starting on the upper field and finishing on the track. We will score the races as alumni vs the current team, separated by gender (if we get more ladies this year). The final Roster will be posted soon. The 2nd Annual Alumni Challenge results are now available online. There was a new course record set by JT Sullivan (Class of 2007), who successfully defended his title. The current Team defeated the Alumni with a score of 24 to 45. The top 12 high school finishers qualified for the Mammoth Running Camp in August. Click the button to see the results. Results are also available on XCStats. Thanks to #Brooksrunning for the award swag. The second edition of our Alumni Challenge race will be held on Saturday, July 29. We are looking for volunteers who are Doctor's, Physician Assistants, nurses or Physical Therapist who would be willing to work from 1:30-6:00pm on June 7th. Darrell Cross had spent plenty of time trying to teach his nearly 10-year-old daughter, Michelle, how to ride a bike, but even training wheels weren’t working. 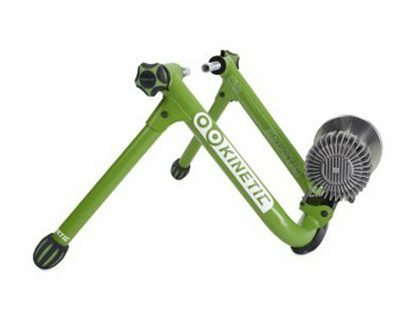 A bicycle shop employee told him to take off the pedals and let her “Fred Flintstone it,” or push herself on the bike using her feet. Turns out, he was on to something. The pedals removed, Michelle guided the bicycle through the neighborhood for an entire weekend. Soon after, with pedals reattached, she was riding like a pro. Everyone is welcome to join us for a potluck picnic this Thursday. We would love to get the whole team together! It is located at Altisima Park and is set for 12-3. This is a great way to get to know your teammates! Any and all Trabuco XC Alumni are invited to join in the fun at the Inaugural Trabuco XC Alumni Challenge. The 3.0-mile race will take place on July 29, 2016 at Trabuco Hills. The alumni race will also serve as the current team's first summer time trial. The annual high-altitude running camp at Mammoth Lakes has been scheduled for Sunday August 7 through Saturday August 13. Runners qualify* at the first team time trial on July 19. The cost for this year's camp is $600 per person. The camp includes meals, one-on-one instruction with the coaches, group meetings and discussions, epic trail runs, and team bonding time. Runners who do not qualify for the Mammoth Camp will continue practicing each morning and will have some fun experiences of their own. On Monday, April 18 2016 three of our Cross Country and Track coaches will run the Boston Marathon. Head Coach, Liam Clemons, and two of his assistants, Mark Donaldson and Sally Boles will travel to Boston on Saturday to compete in the nation's oldest marathon. The race starts at 10:00AM EST. Coaches Clemons and Donaldson will start with Wave 1 at 10:00AM and Coach Sally will start with Wave 2 at 10:25AM. Live runner tracking is available through the Boston Marathon website. If you would like to track the progress of each coach, you can download the Mobile App or get Alerts via Text or Social Media. Searching via bib # is the easiest way to track the coaches. There are six to eight coaches present at each practice to ensure that every runner gets the attention they need. The fee for this year's camp is $252, which works out to a mere $3.50/hour. Each registered runner is eligible to participate in the first tryout race on July 29 (only registered runners may participate). There will be a second tryout for non-registered runners on August 19. The Conditioning Camp officially concludes on August 6, but practices will continue each day until school begins. All runners must tryout for the Cross Country Team. Runners must meet or exceed the following qualifying times. Below are the results of the 1600m Time Trials that were ran on November 6. All results were combined to show each runner's overall performance. For all boys who ran under 6:00 and girls who ran faster than 7:00, this serves as your tryout for the Track & Field Team. Congratulations! If your time was slower than 6:00 for boys and 7:00 for girls, don't despair, you will have multiple opportunities to run faster before February rolls around. Some athletes will make the team based on overall attitude, attendance, and improvement. Character counts! Today's time trial at the Lake Forest Sports Park was awesome to watch. The new course challenged the runners to deal with varying grades, terrain, and pacing. We did have to abbreviate the warm-up due to another event taking place at the park, but the athletes responded well and, for the most part, rose to the challenge. The top ten finishers in each gender will compete in the Varsity Sweepstakes race at the Cool Breeze Invitational on Sept. 5. Happily, there will be two freshmen girls joining that group, Hennnessey Evans and Macie Whitter. Great job to you both! Congratulations to overall winners Kyle Hess and MaKenna Duda! Congratulations to everyone who set a PR today as well. Click the links for Results. Results for our first time trial of the summer are linked below. The course was 3.0 miles in RSM and O'Neil Park.